– As we all know flights during the holiday season book up SO early and quickly, so be sure to get those tickets booked far in advance (or as soon as you are able to nail down dates). – Check different airlines and airports for the best deals and times. This is something that’s good to do any time you’re planning a trip, but especially during a time when everyone is trying to go everywhere. You might find better deals at a smaller airport or with an airline you don’t normally fly with. – Leave early enough so you give yourself PLENTY of time at the airport. While traffic may not be your biggest concern, driving into the airport and getting checked-in, through immigration and security can be an absolute nightmare during the holidays. – If you have the means to do so, get TSA pre-check. It will save you so much hassle and time at the airport. You don’t have to worry about taking off your boots and sweaters and taking out your laptops and tablets, which can make a really stressful situation just a little less stressful. – Get all of your travel documents together and organized using a travel organizer. I always have a passport case/cover (I’m obsessed with the Kate Spade ones), which I keep my passport and boarding pass in, but I’ve also started using a travel organizer to keep my flight confirmation, check-in documents and all those other things. I’m not naturally a very organized/neat person, so having a case where I know all of my important things are prevents me from having to desperately rifle through my bag looking for my boarding pass. – Have a portable phone charger and extra cords. Chances are you’ll be spending a lot of time in waiting around in lines and you’ll most likely whip out your phone to pass the time. There’s nothing worse than traveling or being on a flight and realizing your phones about to die. Be prepared, have portables and chargers with adapters so you can charge your phone wherever and whenever you need to. – Don’t waste time or money on airport food. I know this is common knowledge, but seriously. The number of times I’ve dropped insane amounts of money inside the airport on food is crazy. Try to be prepared and have food/snacks with you so you don’t end up waiting in long lines or spending $15 on a small sandwich. Also try to have some healthy snacks for the flight as well (veggie sticks in a little baggie is so easy). – Check in online and get a digital copy of your boarding pass, if possible. These days a lot of airlines allow you to not only check-in, but check your bags in and get your boarding pass on your phone. If you’re given the option to do this, do it! It’s going to save you so much time at the airport, especially during the holidays when everybody is going somewhere. – Give yourself enough time. I’ve always been one of those people who wants/needs a lot of time at the airport. I’d much rather sit there and be bored than end up missing my flight. Especially during the busiest travel time of the year, you never know what’s going to get you held up. So be prepared and get there with plenty of time. – Have a change of clothes (top, pants, undies and all). You really never know what’s going to happen when you’re traveling but I would hate to be in a situation where something spills on you or maybe you leak a little (ladies…) and you having nothing to change into. I also just like having a extra clothes on longer flights/trips to change into half way so I don’t feel so gross. – Have all your favorite shows, music and movies downloaded on your computer, iPad or iPhone. The night before a flight I always make sure that everything I’m going to want on the plane is downloaded so I don’t have to worry about it the next day. I forgot to do that the night before once and tried doing it at the airport, but the s****y airport wifi was not having it. Do it ahead of time and you’ll be glad you did. – Have a pillow or blanket and a neck pillow and eye mask. Seriously, it’s the best thing ever. I love having my own pillow or blanket with me on the plane (as annoying as it may be to carry around) because it helps me feel comfy and safe. And as far as the neck pillow and eye mask go, it’s just a must-have. You don’t want to fall asleep on a flight only to wake up unable to move your neck, it’s awful. And since you can’t control the lights on the flight an eye mask will help you sleep at any time. – This is one of my golden rules of traveling, but HYDRATE. I can’t emphasize this enough, when you’re up in the sky with the air circulating throughout the cabin you get so dehydrated. Not only do you want to be drinking a ton of water (but seriously though, like a ton), you also want to make sure you have moisturizer and face lotion easily accessible. Happy Thursday loves!! Being back in LA for my sophomore year of college, it’s really hit me how much I miss Asia and Singapore. I knew I was going to miss it, but I had no idea how much. So for today’s post, I thought it would be fun to put together a small collection of my absolute favorite photos of my beautiful home. If you’re looking for some SG travel inspo, I have it right here for you! What’s the number one place you want to visit right now? I get asked that question all the time and it’s so hard because the answer is: EVERYWHERE. I would love to not have to worry about school or working or money and just travel the world experience all the different cultures. But since that’s not reasonable, I thought I would sit and put together the 5 places that are at the top of my travel bucket list right now. What do you think of my list? What’s on your list? 1. New York City, USA- NYC, I don’t even know what to say. Everything from the yellow taxis, the bright lights of Times Square and the quaintness of Central Park draws me to the city. I could get lost looking at pictures of New York for hours dreaming of everything I would do when I finally get to go. And it would be even better if it were Christmas. The tree at Rockefeller Center, hot chocolate at Serendipity (just like the movie!!) and New Years Eve in Times Square, ugh it would be so magical! 2. Sydney, Australia- I honestly don’t know how I lived in Singapore for over 18 years and never visited Australia, but it’s very high up on my wishlist. Not sure what it is, but I always just get such a chill/relaxed vibe from Sydney and the people seem so incredible warm and welcoming! And the growing food scene doesn’t hurt either. 3. Sicily, Rome and Amalfi, Italy- Isn’t this pretty much a staple on everyones bucket list? If I could spend a chunk of time exploring every single city in Italy I think I would die. But these three cities are the top three on my list for sure. I’m so intrigued by the contrast of the bustling city of Rome and the pure, calm, breathtaking Amalfi Coast. And then I would just love to move to Sicily and live on a winery and eat all the seafood I want all day. 4. New Orleans, USA- New Orleans is definitely a recent addition to my list, but it’s so intriguing to me. Obviously it would be amazing to go during Mardi Gras, but any time would be incredible. The atmosphere just seems to laid back yet fun and old school funky. I would love to stroll through the French Quarter and spend the afternoon eating beignets at Cafe du Monde. 5. Island Hopping in Greece- Although I’ve been to Athens and the island of Sifnos, I’d love to go back and just spend time on a bunch of different islands. I love everything about Greece, the food, the people, the scenery, the oceans, it’s spectacular. The dream is to spend a month island hopping and spending the evenings sipping on wine and gorging on spanakopita and baklava. Wouldn’t that be amazing! As we are quickly approaching the last couple weeks of (official) summer, I just wanted to put together a quick little blog post of my highlights from the summer. I’ve been back at school for a week and a half now an reminiscing about all the fun times and wishing I was still sitting by the beach and soaking in the sun. I hope you all enjoy this post and please comment some of your favorite summer moments down below! 1. 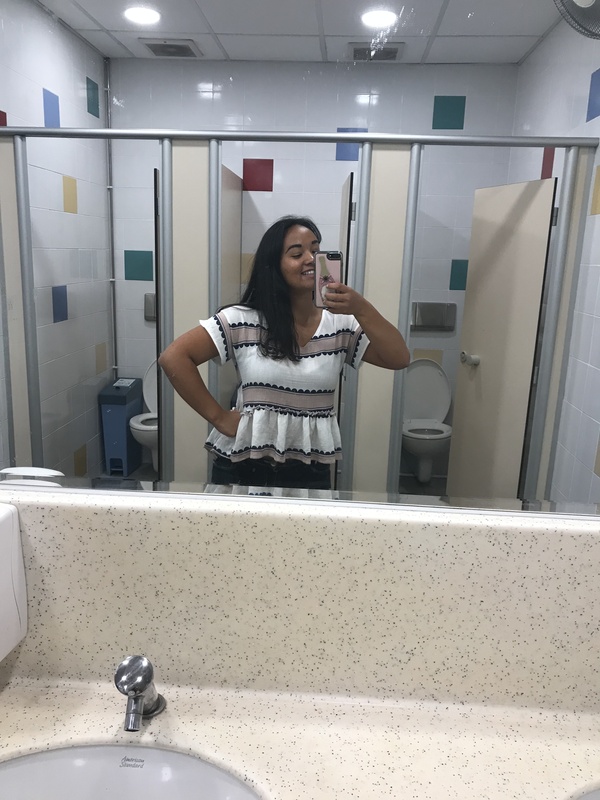 Internship in Singapore- I was extremely lucky to be able to go back to my high school in Singapore for the last 5 weeks of their school year and intern with one of the programs I fell in love with. I was able to work directly with teachers and was even given the ability to run a few of my own classes and activities. Being a teacher is something that means a lot to me and this opportunity only made me realize my dream even more. It was amazing to be able to work directly with students and to learn so much from the teachers who were gracious enough to mentor me. I started my internship the day after school ended, and although it was difficult at times it was also an incredible experience. I don’t have a real photo so please enjoy this mirror selfie from my first day at work. 2. Food adventures back home- While I was working, I also had so much time to relax in Singapore and spend time with my family. And of course, a lot of our time was spent eating at our favorite places (and some new places) around the island. I only put 5 photos in this post because if I put all the photos in you would be here forever. As you can see (here and on my Instagram: @swimeatlove) I had a lot of Asian food simply because I was craving it SO MUCH after being back in LA for a semester. I honestly can’t pick a favorite or highlight meal because everything I had was so good. But I loved that I was able to enjoy a fine dining meal (at Level 33) as well as a simple food court meal of chicken rice. 3. Beach getaway in Phuket- I wrote a whole big post on my trip to Phuket, so I’m going to keep this one short and sweet (but go check out the other post if you want to see more!). Most people already know this about me, but I’m obsessed with the beach, so getting to spend a few days in one of my favorite places with my family was definitely a highlight for this summer. We were all able to just chill and lounge around by the beach or pool sipping on mojitos and pina coladas- it was perfect! We stayed at our favorite resort (Le Meridien, Phuket) and loved the food, the spa and of course the private beach and sprawling pool. We got to go out to the town each evening and explored the area and ate at some of our favorite places around Phuket. It was the perfect summer getaway. 4. Lake days- After all of the fun times in Singapore, and a chaotic international move, we finally got back to some stability by spending over a month at our family lake house, which we do every summer. Nestled in between the mountains, the serene lake is by far one of my favorite places to be. There are so little distractions (we just got a flushing toilet last year and wifi this year!) and it’s just so peaceful. I spend the days lifeguarding and hanging by the lake, and then we spend the afternoons looking for the best and freshest summer produce which we then use to make fun, summery meals. We have game nights, do BBQs and have fun with fireworks and sparklers and it’s seriously the best thing ever. I look forward to being back at the lake the day after I leave. It’s the absolute epitome of summer. 5. Adventuring Tokyo- After leaving the lake for the summer, I was able to spend a full week back in Tokyo (which also happens to be our new home). While we spend time in Tokyo every summer, this year it was all about finding the comfort and familiarities of the city that would help to make it feel like home. We did some of the things we love to do (shopping in Shibuya, eating at our favorite restaurants), but we also did some things we’d never done before. Of course we discovered some new restaurants that will definitely be added to our go-to list, but we also did some fun new things like going to the summer festival (matsuri) in Azabu Juuban and exploring the neighborhood around our new house. I loved being able to spend my last week of summer with the people I love doing what I love (basically eating and traveling, haha!). I hope you all had as good a summer as I had. It was by far the best one yet. Enjoy the last little bit of the warm weather and I hope ya’ll are getting excited for fall! Here I am, once again, getting ready for another trip. This one is a little different since my family is leaving Singapore after over two decades to start a new adventure in Tokyo. As I’ve been preparing for this trip, I’ve been trying to think of what I want to have with me to make the trip as comfortable as possible. Usually I love flying, but this time I’m prepared to be overwhelmed with emotion as we are saying goodbye to the only home my sister and I have ever known. With that, I decided to put together a little “must-haves” for the flight. These are some of the things that make me feel safe and luxurious on a flight. I’ve done a lot of other travel posts before, so be sure to check those out by typing “travel” in the search bar. Hope you enjoy this post and comment some of your favorite in-flight essentials down below! 1. Phone Charger- Starting off pretty basic, but I always carry around a phone charger with me. Whether I plug it in while waiting to board my flight or charge my phone while actually on the plane, having a fully charged phone always makes me feel more comfortable knowing that I can reach somebody at any time. And plus, with all that free time there is lots of game playing, social media scrolling and other things that are eating up all your battery. 2. Water- I always have a water bottle with me on the plane whether it’s a plastic one or one that I’ve brought with me. When you fly, you get extremely dehydrated so it’s very important to drink more water than normal. Don’t be afraid to ask the airline staff to fill it up for you or to bring you some water. I always say I’d rather have to go to the bathroom multiple times during a flight than get off the plane with a massive headache. 3. Face Masks- Along with your body getting dehydrated on flights, so does your skin. The cabin re-circulates oxygen through the air making your skin breakout prone. One way to avoid walking off the plane with a new friend on your face is to use the time on the flight to do a face mask. I know it may sound crazy to be sitting there with stuff all over your face, but your skin will thank you at the end of the long journey. 4. Lavender Oil- This is actually something I always carry with me, but especially so on the plane. My mom got into essential oils a while back and I’ve finally caught on as well. I’ve been constantly amazed at the power of Lavender. It does everything from prevent bruising to stopping a bad bleed or even clearing up a zit. I also like to add a drop or too to my moisturizer if I need a little extra hydration. This is one thing I always find myself reaching for when I’m on a flight and I’m always glad that I have it. 5. iPad & Netflix- I think that downloads on Netflix is arguably one of the best things to ever happen. I have always carried around my iPad while I’m traveling so that I could watch a movie I’d purchased or read a book, but now I always download as many TV shows and movies as I can before getting on a flight. I love watching documentaries comedies on flights because they’re light, funny and entertaining, as opposed to watching a thriller or a horror (I could never do that). Some of my favorites for a plane ride are Mean Girls, Bridesmaids, CrossFit Games documentaries Full (and Fuller) House, Friends, and Queer Eye. 5. Wet Wipes- This is something I’ve more recently started doing, but I always have wet wipes when I travel so that I can wipe down my seat, the TV screen, the remote, the tray table and the arm rests. I can’t believe I haven’t always done this, but if you really stop and think about all the people who’ve touched those things and the germs that are on there, it’s pretty gross. So I always make sure to wipe things down the second I get to my seat. And with me being a bit of a klutz, I always find myself in need of a wet wipe. 6. Neck Pillow & Eye Mask- My parents got me a neck pillow and eye mask set from Victoria’s Secret about 5 years ago and I’ve had it with me on almost every flight since. I always find that using a neck pillow is a lot more comfortable than leaning your head all the way back on the seat or leaning it to the side. You don’t want to wake up after sleeping on a flight without being able to move your neck. As for the eye mask, it’s the best thing ever. You don’t have control over the lighting on the plane, so it does wonders when you want to take a quick nap while all the lights are still on. 7. Toothbrush and Mouthwash- I always always always have to have a toothbrush and mouthwash (and tons of gum) with me on flights, especially if it’s a longer flight or one with a layover. First of all, I’m super big on oral hygiene, and I always feel like having that minty flavor in your mouth just helps me feel a lot more fresh and put together overall. And if you’re on an overnight flight you still need to stick to your routine and brush your teeth and do all that jazz before dozing off. 8. Makeup Basics- I’m not one to wear a full face of makeup on a flight (or any at all), but I do love having a little bit of the basics to smack on right before I get off the flight. It helps me feel alive and human after being a zombie on a flight. And if I have friends or family picking me up at the airport, I feel like having a little bit of makeup on makes me look more presentable and like I made an effort for them. The basics I like to keep with me are eyebrow products, concealer, mascara and a tinted lip balm. 9. Dry Shampoo- One of my biggest pet peeves when it comes to beauty is oily hair, I absolutely cannot stand it. And for some reason every time I get on a flight, whether it’s short or long, I always walk off with oily roots. So to combat that I always carry around a mini sized Not Your Mother’s Clean Freak dry shampoo just to spritz in my hair right before getting off the plane. I love it and the smell is also amazing. 10. Snacks! !- If there’s one thing I will always have with me no matter what, it’s a ton of snacks. After getting sick from airplane food five years ago, I’ve had a really bad aversion to it and almost never eat it. So I have to make sure I’m stocked with snacks of all kinds to keep me going. I love having healthy snacks with me like pretzels and hummus, dried fruit, protein bars, and trail mix, but I also let myself splurge a little bit when I’m on the flight with a bag of chips or some chocolate or candy, just to feel like I’m treating myself a little bit. I hope you all enjoyed this post and found it helpful. Happy traveling!! Living in Singapore, long weekends would typically consist of a quick trip to paradise, Phuket. Going about once a year for a while, it’s become one of our home away from homes. After our last trip, I decided it was finally time to sit down and share all the things I love about Phuket with all of you. I will leave all the links down below and hope you venture out to this little gem of an island in South East Asia! After staying at a bunch of different hotels and resorts, we finally found our favorite and go-to place to stay: Le Meridien Phuket Beach Resort. While it is about an hour drive from the airport, the resort sits only ten minutes away from the downtown area (Patong and Karon) making it super easy to get around. The resort is sprawled out over a huge piece of property with it’s own private beach, tennis courts, an amazing spa, two tropical pool, multiple eateries/bars and stunning, comfortable rooms. While the rooms may be a little older than others, they’ve been kept really well and feel modern with a vintage twist. The private beach is only a few steps away from the pool area and are lined with lounge chairs and bean bags, while crystal blue water and really clean sand. They offer a range of water activities from jet skiing to kayaking and surfing. In the middle of the day when you’re looking for a quick bite, you can just head over to Ton Son out by the pool to order anything from Thai to Italian and American. You can also head over there for before-dinner drinks where they offer classic cocktails as well as tropical/Thai cocktails. One of my favorite things at the hotel was the energizing shots they had at breakfast. Every morning they had a couple different kinds to really get your body working and wake you up. My favorite was the watermelon-chili shot which was just to die for. And what’s a trip to the beach without some relaxing time at the spa? Le Spa offers different treatments from massages to scrubs and facials, all beach and tropical themed. Our time at Le Meridien is always made even better by the super friendly and helpful staff. We absolutely LOVE staying at Le Meridien and cannot wait to spend more nights there. Like I mentioned above, the food at the hotel is not like any others. It’s very different and authentic, but still really good. However, I love spending time around Patong and Karon exploring other places to have meals. One of our all time favorites is Eat. Bar & Grill in Karon. Priding themselves on incredible service and hearty, rustic food, the little bar/restaurant serves burgers, steaks and other unique dishes. After going there four times over our past two trips, I’ve had some of my favorite dishes there. Some that I would recommend are the burger and fries, the chateaubriand (steak), the beef tartare, the lobster cappuccino, and most importantly the mojito bucket (5 servings of a mojito in one big bucket, photo below). This year we also went to Baan Rim Pa, which is one of the only “fine dining” restaurants in Phuket serving authentic Thai food. We had the chicken and crab Thai dumplings, grilled eggplant salad, minced pork with noodle crackers, green curry with chicken and stir-fried morning glory, and a really good passion fruit mojito. The food was all really good and some of the best Thai food I’d ever had (and I’ve had a lot of Thai food). Other than those two places, we also love going to different seafood restaurants along the water front and trying different dishes. As most of you know, my family LOVES food and one reason we love going back to Phuket so often is because of the huge variety of amazing restaurants to chose from. While you can have your hotel arrange a car/transport for you, one way I love to get around is by taking a tuk-tuk. A tuk-tuk is motorcycle powered vehicle with seating for passengers attached to it. They’re commonly found around South East Asia and are open air. I love driving back to our hotel at night after dinner with the wind blowing through my hair and the sound of the waves crashing on the shore in the background. Depending on where you flag one down, a 10-15 minute drive can be anywhere from 10-12 SGD, which may seem a bit pricy but is normally much less than having your hotel arrange transport for you. If you are around Patong or Kata beach, it’s really easy to walk around. Whether you’re beach hopping or looking around the market, I always say that walking around is one of the best ways to explore a new destination. And the excitement of Phuket nightlife makes the evening a lot more fun and interesting. When I go to the beach, my absolute must-have is a ton of bikinis. I love mixing solids with solids and solids with prints from different brands. Some of my favorites for bikinis are Cotton On, Victoria’s Secret (now Pink), She In and Hollister (and Jolyn for suits that won’t budge). I don’t like wearing the same suit more than once a trip (I know, I’m a snob), so I love having variety in my suitcase. In addition to suits, I wear all different kinds of cover-ups and summery rompers and dresses that work at both the beach and a casual meal out. For sunglasses, I personally don’t love wearing nice/high-end glasses at the beach because I love spending time in the water and body surfing waves so I’m always paranoid that I’m going to lose a nice pair. I typically have a couple cheap pairs of Cotton On sunglasses that are perfect for the setting and look bomb in all those insta photos. For a more in-depth look, check out my summer beauty post (linked below)! I always love a good beach getaway, and Phuket is the perfect destination for a stress-free and relaxing weekend away. Have you been to Phuket? If so, what’s your favorite thing to do there? If you haven’t what’s your favorite beach getaway destination? Comment down below! I hope you all enjoyed this post, and I will talk to you soon! just the cutest and biggest pool surrounded by palm trees, no big deal! another dinner at Eat. Bar & Grill, our fav in Phuket!! bye bye for now, see you soon!